text/photos by Capt. Thor Janson, navigator / explorer, facebook.com/nubliselva. Hidden Treasures of Chapinlandia – Alta Verapaz. New highways in Guatemala are opening up to the casual traveler incredibly beautiful, previously little-known locations, now easily accessible for any vehicle in good operational condition. The road between Raxrulha, Alta Verapaz and San Luis, Petén used to be only for bold travelers in 4×4, high-clearance Jeeps and trucks capable of enduring a lengthy, spine-jarring trek, and even for the intrepid jungle sojourner the road was often impassible in the rainy season. Now all that has changed and a beautiful new paved highway connects these previously isolated and remote outposts, including access to the spectacular Las Conchas Waterfalls. 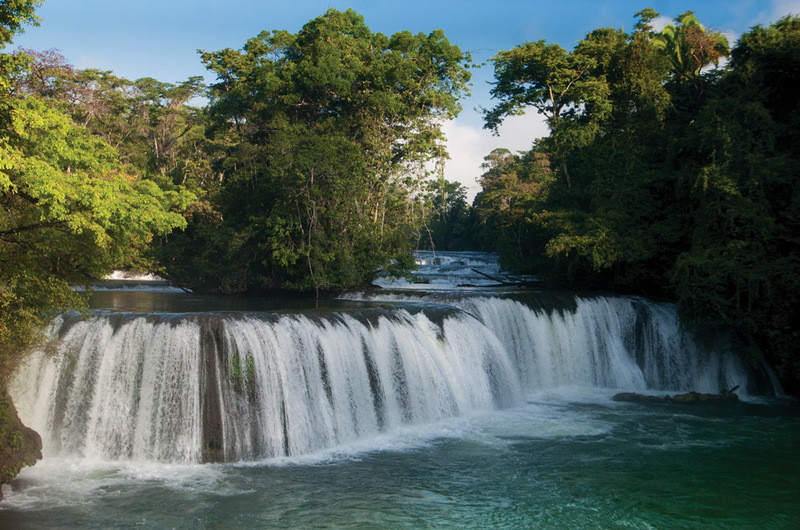 Las Conchas is the translation of the place name Se Pemech (The Snails) in the local Q’eqchi’ Mayan language and refers to the many piles and deposits of mollusk shells found near the falls. 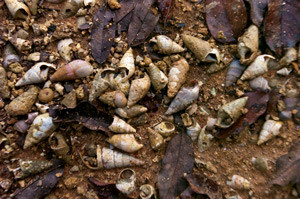 The abundant, edible snails have been an attraction for the local indigenous population for countless generations. The small shellfish were collected by hand along the banks of the Chiyú River and then roasted on the coals of a campfire making for a delicious, nutritious, free feast. Limestone karst dominates the area, which is full of sinkholes and caves. 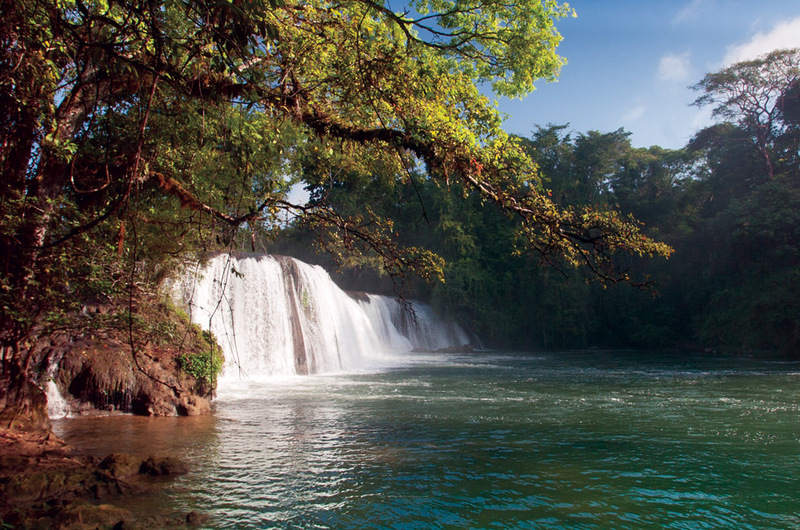 Las Conchas Municipal Park comprises a series of spectacular waterfalls, turquoise pools and numerous, diverging rivulets and creeks. A wide variety of birds and other wildlife, including red-eyed tree frogs and a multitude of butterflies, can be seen in the area. 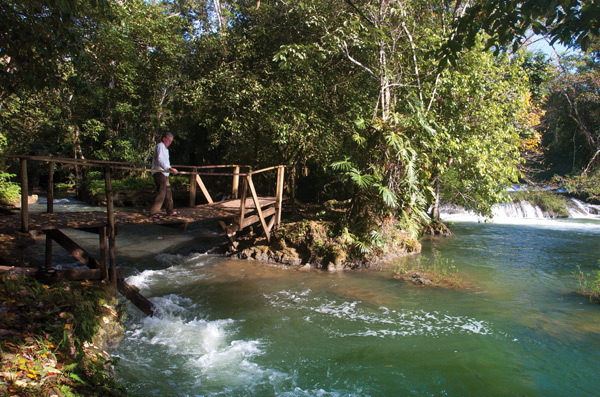 Managed by the town of Chahal, the park has recently received a grant from the Guatemalan tourism ministry (INGUAT) to improve the infrastructure. Most overnight guests camp by the river’s edge, but a few primitive cottages are also available for rent. A wide variety of birds and other wildlife, including red-eyed tree frogs and a multitude of butterflies, can be seen in the area. If you’re lucky, you might see an arboreal kinkajou or inquisitive coatimundi. Located 372 kilometers from Guatemala City, the park can be reached via excellent paved roads from Río Dulce or Cobán. From Río Dulce simply drive north on Route CA-13 toward Poptún. At the village of Cadenas (a few kilometers before the border with Petén Department) you will see a sign indicating the turnoff for Las Conchas. From there just follow the signs and you will have no trouble finding the park. An alternative route is to travel to the departmental capital of Cobán and from there drive north to the town of Chisec and on to Raxrulha, where you will see signs indicating the road to Las Conchas. greetings mr. janson. nice article. spoke to you 27 oct, i think. best of luck on your ventures.